Treat your bar area to a touch of tradition with the Tetbury Oak Bar Stool Cream Leather. The Tetbury is set at the perfect height for standard kitchen worktops, allowing you to bring classic style and sumptuous comfort to an array of bar settings. Classic cream bonded real leather upholsters the sprung and belted seat pad, creating an effortlessly comfortable design. 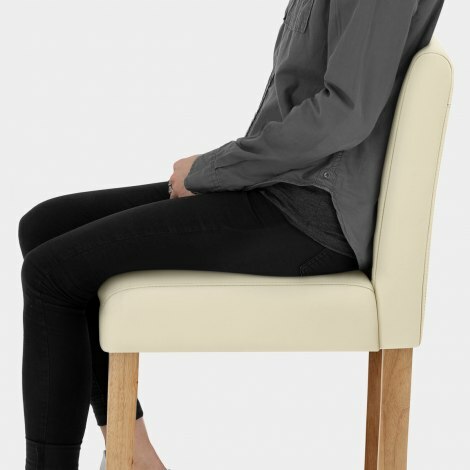 The tall backrest has stitch detail and offers ample support to your back, combining with a footrest below to enhance your seating experience. A strong fixed height frame is formed by the four solid wooden legs, which feature a divine oak finish and rubber floor protectors underneath. "They are very comfortable and nice & sturdy"
Lovely stool and just what I was looking for. Delivery as expected. Really pleased with these stools, they were exactly what we wanted. We think they look great in our kitchen. They are very comfortable and nice & sturdy. The leather is soft and easy to wipe clean. Fantastic quality these look lovely in our kitchen. Quick delivery too! 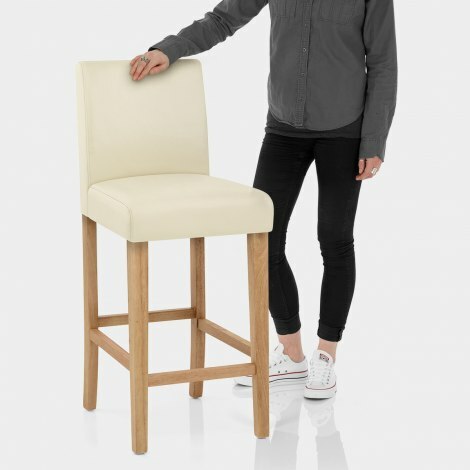 Good quality stools with excellent instructors to make up.